I thought ahead (unusual for me) and photographed this Bull thistle (Cirsium vulgare) this past August, as I knew I wouldn't find one blooming in California in November. More commonly known as Spear thistle in auld Caledonia, this spiky weed is the national symbol of the lugubrious land located at the northernmost reaches of Great Britain. It's wild and quite beautiful up there. If you are so inclined, pour yourself a wee dram of scotch and toast Andrew, Patron Saint of Scotland. I myself will be toasting him with something made from the grape, not grain. And so concludes my year of blogs dedicated to the Patron Saints of England, Wales, Ireland and Scotland. Amen! Cue Jimi Hendrix! It's week 14 of my Wines of the World class. This evening there were 30 wines to try from 12 states in the good, old US of A. The usual American grape-suspects where in tonight's vinous line-up; Concord (Vitis labrusca), Norton (Vitis aestivalis) and Scuppernong (Vitis rotundifolia). Thrown into the fray were some more readily recognisable Vitis vinifera cultivars; Cabernet Sauvignon, Chardonnay and Merlot. Also represented were some French-American hybrid direct producers, bred for their hardiness and disease resistance; Chardonel, Vidal blanc and Chambourcin. Grapevine cultivation has a rather long, and often disastrous, history in North America. Exploring Vikings, upon landing on the American mainland, circa 1000 AD, named it Vinland for the grapevines they discovered growing there in abundance. Some seven centuries later, England was convinced that the New World could become one, giant vineyard: In 1657, King James I decreed that all settlers must raise grapes. However, the native grapes of America made poor tasting wine, so what was a thirsty colonial to do? Then along came oenophile Thomas Jefferson. Hoping that wine would become the everyday drink of Americans - in part to counter the ever growing consumption of that evil, reprobate spirit, whiskey - Jefferson planted, and replanted, European winegrape varieties at his plantation inVirginia, Monticello. Unfortunately for Tom, each vineyard replant died within a few years from a mysterious, but as it turned out native, disease. Cue phylloxera! So on to this evening's offerings. The wines of the USA were astounding, but not in a particularly good way. The foxy character, associated with Vitis labrusca, was evident in a few wines tonight. It has variously been described as smelling like fox urine, or as having a cosmetic-perfumey quality. Dr. Krebs informed the class that the foxy component was most likely the smell of a female fox in heat - lovely! Best white wine? Best red? It's tough. From Pennsylvania, the Blue Mountain Winery, 2011 Riesling was drinkable, but not very varietal like. From Missouri, the Augusta Winery, 2011, Norton had great color extraction and nice acid, but that's about all I can say about it. The silliest wines of the night were two pineapple wines from Hawaii. The most odoriferous wines were two Muscadines out of Florida - no one in the class could come up with a single descriptor for either of these Sunshine State wines. I did get to taste two wines from Utah. I was interested in these two wines because of my familial connection to this particular state. Castle Creek Winery is located near Moab, on the Colorado River, a part of the world more famous for it's National Parks than it's wine. 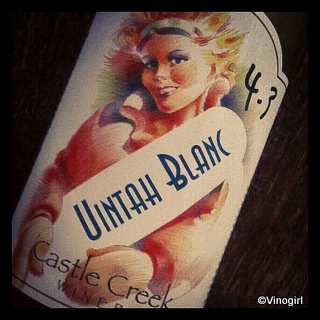 Their white wine offering with the proprietal name of Uintah blanc, made from a blend of Muscat grapes and thus displaying a slight linalool character, was at least drinkable. Their red, a thin, vegetal mess of a Merlot, was not! What a night. Most students were stunned, or at least their palates were. The wines of the USA almost had me wishing for the wines of Eastern Europe! Inspired by an article that appeared in People magazine, some 6 months ago now (what can I say? I'm slow), about celebrity kitchens, I decided to take a quick snapshot of the contents of my own refrigerator. My humble fridge is not quite as highfalutin as Martha Stewart's refrigerator for example, but then again I'm not in the habit of throwing dinner parties for 200, or so, fancy-pants people. All the essentials are there; chocolate, fresh fruit, beer, sparkling wine, egg nog (Vinomaker's), damson jam, yogurt (not essential) and more chocolate. I did not stage this photograph. Well, I did move extra bottles of beer to the shelf below and I put a half used tin of dog food in the bottom shelf of the door - lest you think I'm sort of weird by keeping unrecognisable, recycled animal bits suspended in gelatinous gloop next to my chocolate. Purists, don't be alarmed. The bottle of Mumm, 2006 Devaux Ranch sparkling wine, only went from the wine refrigerator to the non-wine-dog-food refrigerator last night. And it's not going to be kept that chilled indefinitely, I wouldn't treat bubbly that way. In fact, it will be consumed in fairly short order. Tonight to be exact, hic! So what's in your fridge? 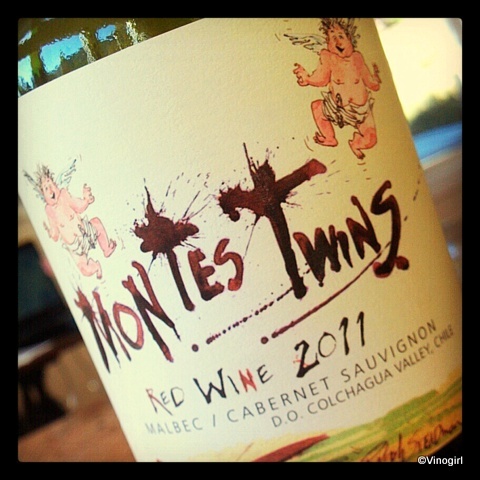 The Montes Twins, that is. I am revisiting South America, Chile to be exact, but only because another Ralph Steadman label caught my eye in my local supermarket. C'mon, what is there not to love about a wine label with a nappy-clad cherub on it? Better still, how about a label with twin nappy-clad cherubim on it? Love it - even if the pudgy putti do somewhat resemble inebriated 2 year olds! The Montes Twins 2011, Red Wine is a 50/50 blend of Cabernet Sauvignon and Malbec. This wine is a deep, opaque, purple-red-inky monster: colour extraction like this is no doubt the contribution of the Malbec. The bouquet displayed a tad too much new, toasty-cooperage for my liking, but the ensuing vanilla component, paired with the aroma of sun-warmed blackberries, was very pleasing. The vanilla and berry combination translated well through to the palate where they were complemented by a felicitous acidity. Things were gustatorily-groovy until the rather strident tannins stopped my taste buds firmly in their, well, stride. In wine, tartness and astringency exaggerate one another and apparently my threshold for this particular amount of astringency had reached it's limit. But all in all, for $10.99, this wine was a fairly decent tipple. I am thankful for a lot of things in my life; family, friends, good health, good wine and, of course, the Vinodogs. But this year, I want to say a special thank you to Mother Nature (if she's listening) for bestowing upon the Napa Valley a fantastic growing season in 2012...2010 and 2011 were a little rough, ma'am. The poppy seeds that I planted last Sunday will have had a a good watering today. In fact, rainy weather is forecast to continue all the way until Tuesday, double sigh. Wines of the World, week 13, just happened to coincide with the occurrence of the third Thursday in November - which happens to be Beaujolais Nouveau release day. Never one to miss a wine tasting opportunity, Dr. Krebs marked the occasion by adding two bottles of Georges Duboeuf to tonight's roster of wines. As one would expect from 10-12 week old, carbonically-macerated Gamay grapes, the wine was all fruity-bubblegum-ness. I thought it perfectly pleasant, but the rest of the class did not share my view of this frivolous wine of limited breeding. The real business of the night was the tasting of the wines of South America. And as with the wines of the Antipodes last week I was on the whole underwhelmed. For example, there were three Pinot noirs in the mix; one each from Uruguay, Chile and Argentina - all, in my humble opinion, barely recognisable as Pinot Noir. If I had to pick a favourite white and a favourite red of the night...In the white flight I would have to choose a Chilean wine, an Amaral, 2008 Sauvignon Blanc (DO Leyda Valley). For the red, I'm going with an Argentinian selection, a Ksana, 2006, Bonarda (IG Mendoza). They were both drinkable, but I was left longing for something Spanish or Italian. There were 27 wines in all, the most expensive wine that was poured, at $99.99, was a TeHo, 2010, Malbec/Petit Verdot/Cabernet Franc (IG Mendoza). This last wine seemed to be the favourite of most of my classmates. Replete with lots of vanilla-oakiness on the nose, it came across as the most Napa-like. The wine in the photograph? 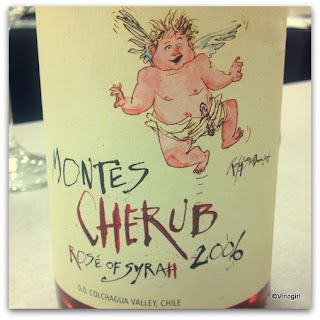 A Montes, 2006, Cherub Rosé of Syrah (DO Colchagua Valley). The wine was alright, but it was the label that I really liked. It is by one of my my favourite illustrators, Ralph Steadman, who, like Vinogirl, is a product of Merseyside. As it's Thanksgiving next week there is no class, but stay tuned for the November 29th installment. This is a packet of Papaver rhoeas seeds I bought when I was home in England last spring. I am going to plant them today in hopes that they bloom next summer: a reminder to me of the many, many sacrifices that countless heroic men and women have made so that I may live in peace. The Cameo Cinema is a very small cinema, just some 140 seats, and I assumed this would be a popular film. Pass holders queued to one side, the folks for rush tickets, Vinogirl included, to the other. I was about 6 people back, so it was looking promising. My friend came from the pass holder queue to say a quick hello before being admitted into the cinema. Not even 5 minutes later, he reappeared and informed me and my queue-mates that today was not going to be our lucky day. Apparently, three rows of the tiny cinema had been reserved for some big wig and there simply weren't enough seats for everybody else. Day Pass holders with their $50, red laminated passes - now a badge of shame, like some modern day Scarlet Letter - who initially had been admitted were now being unceremoniously ushered back out on to Main Street, persona non grata-like. These types of goings-on are a perfect example of why I don't normally attempt to do stuff like this. The Festival organisers can have all the private showings they desire, but I personally don't think they should treat pass holders this way. These type of events are definitely not intended for the average person, like me, who is only interested in seeing one film. I won't bother again. Like the Master Sommelier exam, an exam with one of the lowest pass rates in the world, SOMM is turning out to be one of the most difficult films for wine industry folks to get to see. The Antipodes and South Africa. Tonight's tour of the wine world takes me Down Under - at least it would if I was still in England - to Australia and New Zealand. But not before a quick stop off in South Africa. Despite the illustrious grapegrowing and winemaking traditions behind these three wine regions - wine grapes were planted in South Africa a good 100 years before California - I was a tad disappointed with the wines I tasted. In fact, I found myself overwhelmingly unimpressed. 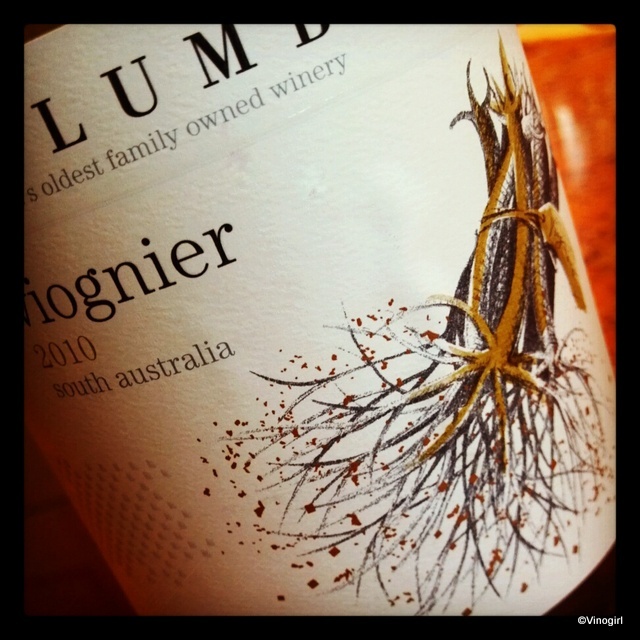 It's week 12 of my Wines of the World class and perhaps I'm a little jaded, after all I seem to recollect that I have enjoyed many quaffable Australian wines in the past. So I am just going to mention one wine from each country that I think I could buy and drink without too much bother or fuss. From South Africa, in spite of the wince-inducing pun in this wine's name, I quite enjoyed a Goats Do Roam, 2006 Goat-Roti (WO Coastal Region). Similar to a northern Rhône blend, this was an easy drinking wine. Hailing from New Zealand a Sauvignon blanc, of course, a Craggy Range, 2010 (Martinborough). Heavy on the pyrazines, I could imagine myself drinking this very chilled on a very hot day. And from Australia, a d'Arenburg, 2008 The Laughing Magpie (McLaren Vale) - a Rhône blend, again. 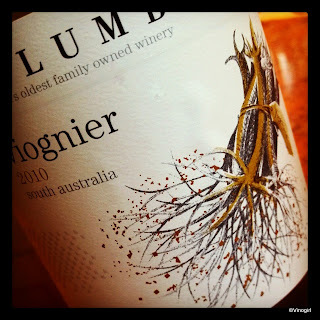 I photographed the Yalumba Viognier just because I liked the label with it's depiction of rootstocks, but I can add that this particular wine displayed strong varietal characteristics. Of the 23 wines tasted tonight only one had a cork closure - a Lameka, 2009 The Marschall Shiraz (Barossa Valley) - suggestive of the notion that in the New World wine producers have thoroughly embraced new wine bottle closures. 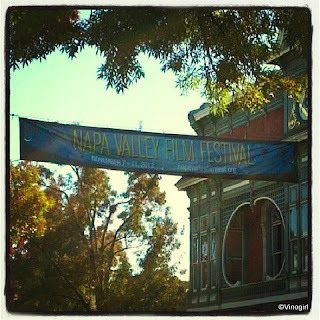 Today, Vinomaker and I attended the Napa Valley Grapegrowers, 2012 Viticulture Fair, an event that is held every other year and one that I really wouldn't like to miss. It's an entertaining and informative trade show with lots of things to see and do; bundles of baby vines, shiny tractors, mobile wind machines and tons of miscellaneous, innovative vineyard tools and equipment. I usually bump into people I know who are in the wine industry and so I enjoy the social aspect of attending the fair also. I was having a great time wandering around when something truly wonderful caught my eye. Behold, the mother of all hen-houses! The CoopMaster Chicken Coop is made in the USA by Western Square Industries (WSI), a company who specialises in, amongst other wine industry equipment the manufacturing of barrel racks. Really good, stainless steel barrel racks. In fact, whilst chatting, the WSI representative, who had apparently noticed my name tag, commented that "You," she was referring to TWWIAGE, "just bought a rather large order of stainless racks." Yes, we did. 2012 has been a bumper vintage, so we needed more racks to put under all the extra barrels we bought. But getting back to the rooster-residence. I have wanted to get a small flock of Gallus gallus domesticus for quite a while, but have been putting off getting them for a number of reasons. The main reason was waiting until I felt V2 was mature enough to not go and worry the poor things to death. Whilst I don't eat a ton of eggs, I am English and I don't know any self-respecting English person who doesn't like a good chucky egg now and again. Fresh eggs are unbeatable. Just as easy as stainless steel barrel racks are to maintain, this steel, powder-coated chicken coop is constructed with the discerning chicken's style, welfare and hygiene in mind. WSI calls this hen-house The Chicken's Hilton. I want one. Besides, what could possibly more perfect in Vinoland than a wine industry manufactured chicken condo in Vinogirl Red? Since last June, when I met Giovanni Arcari, a winemaker for Camossi in Franciacorta, I have been dying to get my hands on some of these little known wines from the Lombardy region of Italy. Having a presentation on Franciacorta wines in my Wines of the World class further fueled my curiosity. Fortunately, in a way, I have been out of Napa quite a lot of late and have been able to visit some proper wine stores, (with the demise of JV Wine & Spirits buying wine in Napa is no fun), where I was able to purchase this bottle of Contadi Castaldi NV Brut. Unfortunately, I couldn't find a bottle of Camossi, sigh. So what is this northern Italian wine region, Franciacorta, all about? Franciacorta is a small, hilly wine appellation on the southern shore of Lake Iseo, northeast of Milan and close to the city of Brescia. The appellation gets it's name from the village of Corte Franca where, in the late middle ages, the local monasteries and abbeys enjoyed the luxury of not having to tithe to the ruling lords. Having produced still wines for centuries, it was not until the 1960s that the sparkling wine industry made its first appearance. Granted DOCG status in 1995, (since 2008, the still wines of Franciacorta are known as Corte Franca), Franciacorta wines are made in the true champagne-method. In fact, if truth be told, the sparkling wines of Franciacorta are made under the most demanding standards for sparkling wine anywhere in the world; longer bottle aging on the lees, smaller yields in the vineyards etc. The most popular style of wine is Brut (which allows up to 12g per litre of residual sugar), but Franciacorta's flagship style is called Satèn - a name conjured up by a marketing firm in Milan to convey the idea of silk and satin. Satèn is made primarily from Chardonnay with a soft and creamy mousse, the result of lower pressure in the bottle - what would be called a crémant in France. Currently, there are about 100 Franciacorta producers, 90% of whom would be considered small to medium in size, with most only producing 100,000 bottles per year. Which brings me to the bottle of Contadi Castaldi I bought. I love their little symbol-logo, it reminds me of medieval runes, or such-like, which are repeated in a cartouche on the glass up towards the neck of the bottle. The wine itself was a light straw colour which spoke of youthfulness and purity - interestingly though, I couldn't find the sboccatura date on the back label. With a toasty fresh-fruit nose, a light and refreshing acidity, a whiff of lemon grass, apple skin and almonds, and a nice, clean finish, I was surprised at how large the bubbles were - portly, vigorous and authoritative - which, for me, instantly distinguished this wine from Champagne proper. I want to try more. The Cadillac of wine: Bordeaux. What can I say about Bordeaux that hasn't been said before? Perhaps the most hallowed fine-wine producing region on the face of the planet, Bordeaux is known mainly for it's elegant red wines, a smaller number of dry white wines and a relatively tiny production of the liquid-gold wines of Sauternes. And of course, the biggest marketing coup of all time - the 1855 Classification of Great Growths of the Gironde. On to the wines. My favourite white wine of the evening was a Domaine de Tariquet, 2011 (AOC Côtes de Gascogne), a blend of four grape varities, but predominantly Ugni blanc which is a variety I am already quite fond of. Most disappointing was a Château La Louvière, 2009 (AOC Pessac-Léognan), a 85% Sauvignon blanc/15% Sémillon blend which held such promise, but was ridiculously over-oaked. The red wines on offer were a bit of a mixed bunch, but represented a fairly wide range within Bordeaux. And speaking of Cadillac, I did indeed taste a Château de la Meuliere, 2008 (AOC Cadillac Côtes de Bordeaux) which was a very pleasant tipple. I had two favourites in this flight. The first was a Château Haut Mayne, 2010 (AOC Graves) and the other was a Le Clarence de Haut-brion, 2007 (AOC Pessac-Lèognan). Both wines, to me, had a very similar nose and palate, but came at vastly different costs - $21.99 and $84.99 respectively - which reinforced the fact that an individual's taste in wine and wine-pricing do not go hand-in-hand. Speaking of the cost of wine, the most expensive wine this evening was a Château Grand-Puy-Lacoste, 2005 (AOC Pauillac) at $138.99 - a nice wine, but nowhere near my favourite. The evening ended with a gem of a wine from the southern end of the Graves district - a Château Rieussec, 2006 (AOC Sauternes). 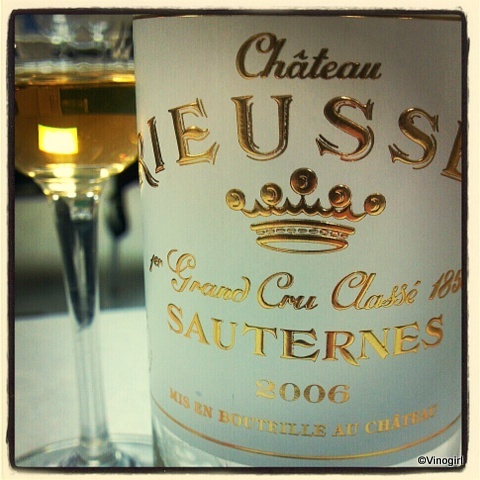 Golden and sweet, and at the same time tart, this young wine was surprisingly appreciated by the entire class - a Bordeaux miracle.